I love food, this is probably why I have struggled with my weight my whole life. 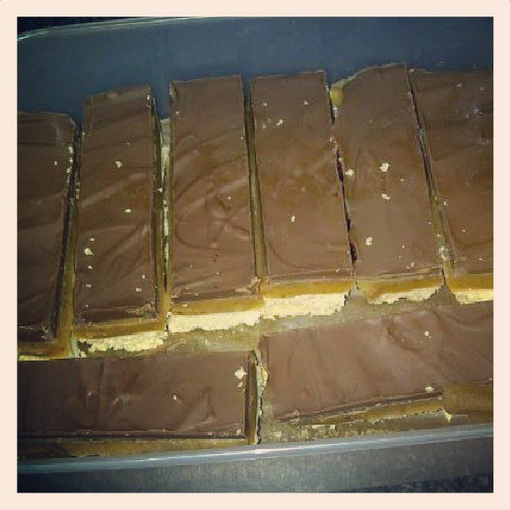 I also love baking and luckily my friends love my cakes (luckily as Mr Hubby doesn’t ‘do’ cakes… weirdo). Anyway here are some recipes and other foodie stuff. This looks complicated, but it is really easy and tastes AMAZING! Preheat oven to 180. Grease and line 3 x 8″ sandwich tins. Cream butter and sugar until pale, Add lemon zest & juice. Slowly beat in one egg at at time (I use handheld mixer). Sift flour (both types) and baking powder together and fold into the mixture. Divide into three tins and bake for 25-30 minutes (in my oven it is 25 minutes) turn them a couple of times when baking. Put aside to cool for 10 minutes. Turn out onto a rack to completely cool. Whisk cream and icing sugar into soft peaks and then you are ready to assemble. 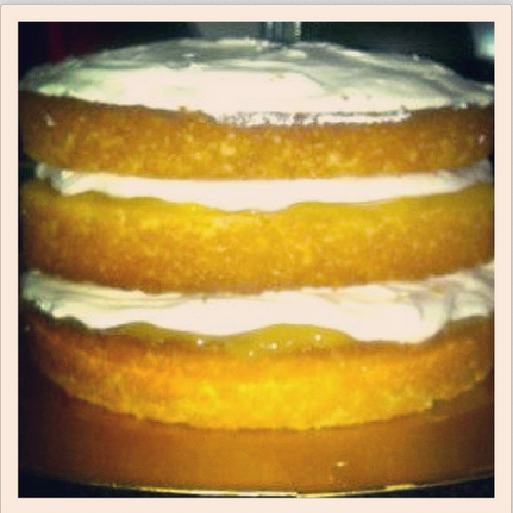 Place a cake on the base and then spread on a layer of lemon curd, a layer of cream and then place on your middle cake. Then repeat again, until you place on your top cake and spread lots of cream on the top. I always overfill, but this cake is seriously easy and looks amaze-balls! Preheat oven 180 (160 fan). Grease 13 x 9 inch tin. Line tin baking paper. Sift flour, baking powder and salt together. Whisk (I use a handheld) eggs, sugar and vanilla extract together for about 8 minutes until fluffy and ribbon like in texture. Using a metal spoon fold in ground almonds and flour mixture very carefully, so you don’t knock out the air out of the mixture. Pour into tin and spread to edges. Bake for 12-15 minutes (my oven is 12), until it starts to pull away at the edges. Leave to cool in tin. Lightly mix cream and icing sugar together until it forms soft peaks. 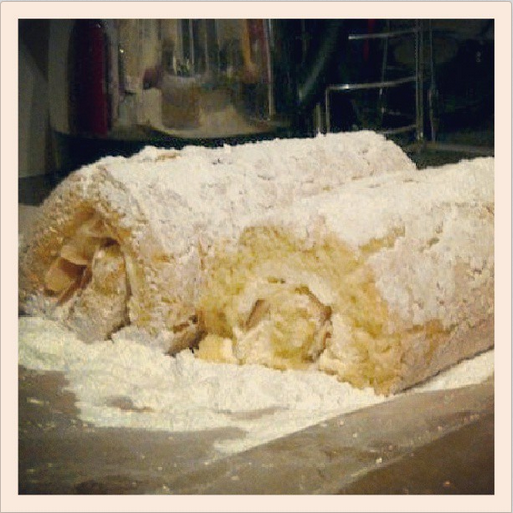 Put a sheet of baking paper on surface and dust heavily with icing sugar. Turn cake out onto paper, removing tin and carefully peel off paper. Spread cream mix over and sprinkle on flaked almonds. Then roll the log using the paper to help. Dust with extra icing sugar if you need to, but there is usually plenty from the paper. May crack but don’t worry and it is so lovely and light. This is better than any you can buy in the shop and is relatively quick, its just the chilling between layers that takes a bit of time. 300g cooking chocolate (dark, milk or a mixture) I have actually used cheap non baking chocolate and it turns out the same. Heat oven to 140 (130 fan assisted). Grease and line a 20cm x 23cm tin and overhang the paper. To make the base- Put sugar, butter and flour into processor and mix until it is a soft dough. Press evenly into the tin, chill in fridge for 20 minutes and then bake for 35 minutes until lightly golden. Leave aside to cool. For the caramel – Put all ingredients in a pan and melt together over a low heat. Then bubble gently and stir constantly for 8 minutes. Don’t stop stirring or it will catch and burn. Pour this over the shortbread and leave to cool until it is set. For the topping – Melt the chocolate in a ban marie and spread over the set caramel. Pop in the fridge. Check after a while and score the chocolate into portions as it starts to set, but before it is set completely. If you wait until solid the chocolate may just crack.